Gua Sha is a technique that has been used in Chinese Medicine for thousands of years and consists of a scraping of the skin. Gua Sha helps to encourage blood flow to the applied area, bringing nutrients to the skin and promoting the removal of toxins. Additionally, you are exfoliating the skin by removing dead and dying skin cells and exposing your younger, plumper healthier-looking skin. 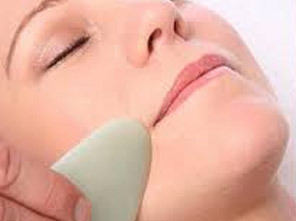 Gua Sha is applied with a piece of jade board andyou can see the results on your face immediately after the first treatment. Attain a brighter, radiant, smoother and healthier skin. Facial cupping is a traditional, safe, comfortable and remarkably effective treatment. 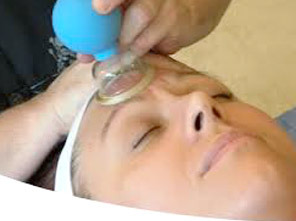 A facial cupping session starts with the thin application of massage base oil. After a light face and neck massage a small Acupuncture suction cup is appliedto assist facial rejuvenation cupping, to create a gentle vacuum to lift the skin and other facial tissue. Lifting the facial tissue activates the lymphatic drainage to eliminate toxins, cellular waste and excess fluid in the face and neck. Rigid muscle tissue in the face and neck is easily massaged with facial cupping. Cosmetic acupuncture is a great choice for aging baby boomers who wish to give their skin a little boost, but don’t want to inject Botox, fillers, or undergo the surgical route. It also works well for younger women (and men) who want their skin to look its best. 1. Cosmetic acupuncture increases the circulation in your skin, brings all those nutrient goodies like collagen and elastin back to where you want it - in your face and neck. 2. The increased circulation translates into better skin tone, fewer fine lines, and even some lift around sagging jowls and baggy eyes. 3.It’s safe, comfortable and with no side effects other than the occasional light bruise, which will heal in less than a week. 4. Some discomfort such as headaches, sinusitis, and acnes can be also treated during a Cosmetic Acupuncture session. 5. Relaxing your entire body and mind.